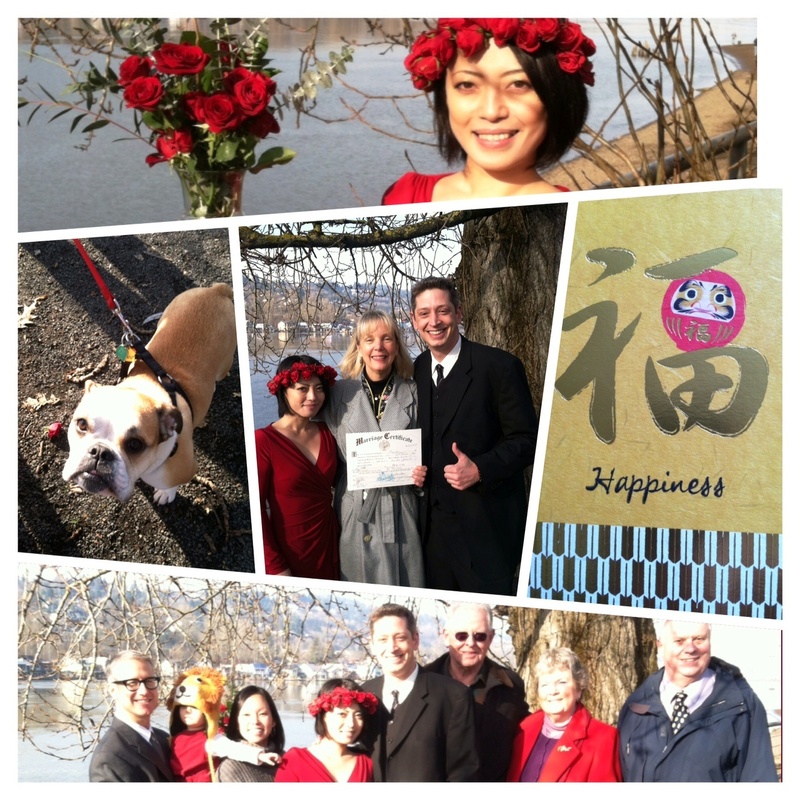 The temperature was frosty but the fog lifted and the sun shone for today’s intimate wedding along the Willamette. Chie (chee-a), lead singer with Japanese pop band, CICCAROLL, wore a crown of red roses to match her dress (brides wear red at traditional Japanese weddings). Bridegroom, Casey, arranged for family and friends to gather at the Oaks Park dog park for the ceremony which was followed by toasts to the newlyweds at The Lucky Lab Brew Pub. Raised in Japan, Casey, who is in the insurance business, speaks the language fluently. The couple is looking forward to making their permanent home in Japan. Their English Bulldog, Matilda Mae, will be making the journey, too. Congratulations, Mr. & Mrs. Shelton. May happiness be with you and love surround you here and in the land of the rising sun. Yoi ryokō o!